I like to think I am an optimist. Someone that sees the world half happy instead of half sad and sees the good in people before the bad. I am also goal oriented. Now, whether or not my goal stays the same from start to finish is a different story. Each morning I set 3 optimistic goals that I work towards during the day. Sometimes they change mid-day depending on how my day is going but I am always work towards something. 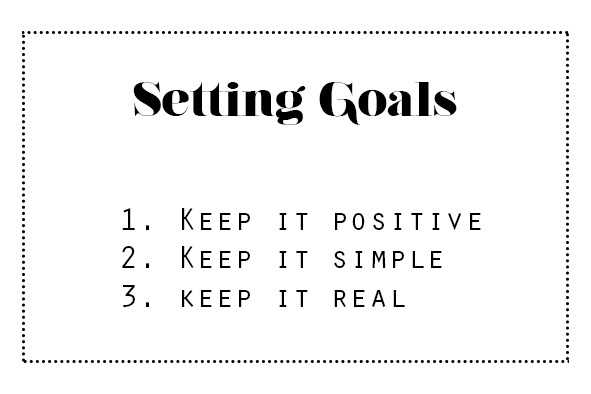 There are 3 easy steps to creating 3 efficient goals. 2. Keep it simple – The more complex the harder it will be to achieve each part. A simple goal could be as easy as only have one cup of coffee today. 3. Keep it real – Make sure your goals are obtainable. Even if the big picture is a larger goal, make your daily goals small and realistic. Just be still and breathe for 5 minutes today. It is amazing what a little thing like this will do to your mojo. I love these tips! sometimes it can be so easy! Absolutely, Patricia! That’s the beauty of them. You’ll feel so accomplished at the end of the week knowing how many of your goals you reached! Do you have any goals you would like to set today?